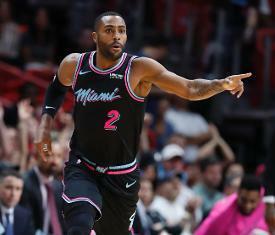 Free agent guard Wayne Ellington cleared waivers Saturday and signed with the Detroit Pistons, the team announced. The Pistons released forward Henry Ellenson to make room for Ellington, considered one of the top players left in the post trade-deadline buyout market. Other teams, including the Philadelphia 76ers, were also pursuing Ellington. Ellington, 31, has had a down season but is expected to earn a lot of playing time after the Pistons traded Reggie Bullock to the Los Angeles Lakers. Primarily known as a 3-point shooter, Ellington's accuracy has dipped to 36.8 percent from deep this season, down from 39.2 percent last year, when he averaged a career-best 2.9 made 3-point field goals per game. Likewise, Ellington's scoring average has slipped from 11.2 to 8.4 per game. The 6-foot-5, 10th-year veteran has a career average of 8.0 points and 2.2 rebounds per game, and has shot 38 percent from 3-point range. The Pistons entered Saturday's action trailing the Miami Heat by a half-game for the final playoff spot in the Eastern Conference. Ellenson, 22, was drafted 18th overall by the Pistons in 2016 but has played in just 59 career games, averaging 3.8 points and 2.2 rebounds in 8.5 minutes per contest.